Your commitments can develop you or they can destroy you, but either way, they will define you. “Since everything around us is going to melt away, what holy, godly lives we should be living!” (2 Peter 3:11 TLB). You don’t have to understand all the implications of your decision when you choose to follow Jesus. You simply need to respond to his invitation and make a commitment to follow him. Every choice has eternal consequences, so you need to choose wisely: “Since everything around us is going to melt away, what holy, godly lives we should be living!” (2 Peter 3:11 TLB). 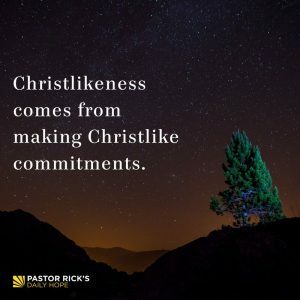 What keeps you from committing to things that will help you develop Christlikeness? How can the urgency of 2 Peter 3:11 affect the way you make your commitments?